A couple came in with a cat in a carrier, said the kitty was their son’s and he had moved to an apartment where he couldn’t keep her. They said if we didn’t take her they would just open the carrier and let her go. Since our mission is to save stray and abandoned kitties, we knew we had to step in and save her. Although she is a bit disoriented by all the recent changes in her life, Shady is a gentle soul. 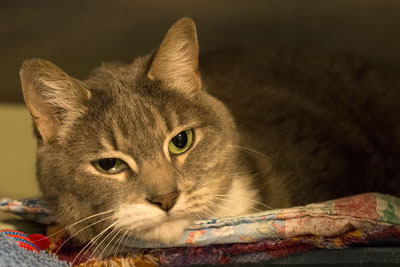 She is a sweet-tempered, 4-paw declawed kitty with a mellow and calm personality. 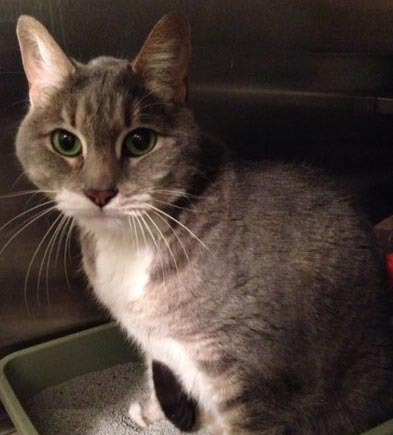 Shady gets along very well with people, is not a fussy eater and would simply enjoy being your lap cat. Come meet Shady Lady today! Shady Lady found a forever home on June 29, 2014. She promises to be a good girl.